I bought them in Prestwick dont know if its nationwide. Not a mis price or anything. Said on the shelf they were down from £2.59. These are normalyy closer to £3 a bottle and currently on a special offer in tesco for £2.50. So if you enjoy a some quality Belgian beer get ure **** down to Aldi! off to aldi at earliest op - great deal! Great price for a bottle of Leffe, brought loads of these back from France in the summer. Just a shame the don't sell the 9% stuff here. Great beer and great price, heat added! 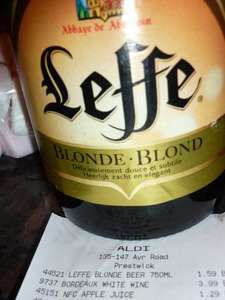 Great price for a bottle of Leffe, brought loads of these back from … Great price for a bottle of Leffe, brought loads of these back from France in the summer. Just a shame the don't sell the 9% stuff here. Mmm. Good deal that. Unfortunately, my leg is in plaster and I can't get out, and I doubt my lady would be so good to get a load in ! Best I've seen for Leffe - great spot. Cheers OP, will get down my local Aldi to try and pick up a load. Was just in Aldi in Paisley to clear their shelves but it was £2.59 in there. So this deal is store specific. So give ure store a phone before u go. Did they all have those littel red/white reduction stickers on tehm or just discounted at till?